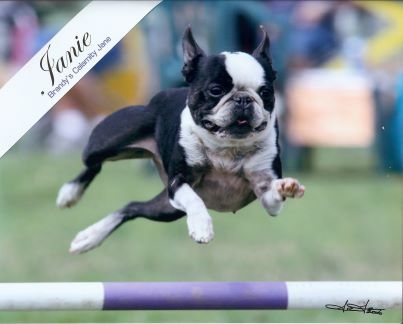 Janie, you came to us as a singleton and the only puppy ever born to Ch. Brandy's Wild Horse Annie. We lovingly nicknamed you "Porky Linky" aka "Linky" for your resemblance to an Oscar Mayer Pork Sausage link! You were 19 days old and thriving when you suddenly turned blue, gasping for breath while nursing. Rushing you to the emergency room, we were told you had aspirated milk in both lungs and were going to die! Insisting we try to save you, Bruce pleaded you not die on his birthday. You fought to stay in this world. You lived in an incubator and were hand fed and nurtured. You miraculously survived all medical errors and were named "Brandy's Calamity Jane." Sandy was your surrogate mother and all humans were family. You would enthusiastically greet everyone by grabbing fingers to nurse. This never ended in spite of your teeth! Janie you lived a tough, colorful and eventful life like your namesake. Though small (10 1/4" at the shoulders), you made your presence known in every performance ring. You were small and bully. In spite of overfeeding and comments about your weight, you managed to acquire 10 points toward your AKC Conformation Championship before getting in shape to compete in flyball and agility! You overcame incredible odds again and again...nearly dying during surgery and going into anaphylactic shock from a bee sting at a trial. Popular and lively, you had a fan club. You were the happiest little girl in the world, so happy to be alive! You thought it was your job to make everyone else happy and you did! You welcomed and greeted everyone and every dog! It was difficult to potty you off leash without your leaving and running to whomever you saw. Once you ran away after children in a motel courtyard, chasing after them to say "hi", but forcing them to seek shelter behind closed doors! 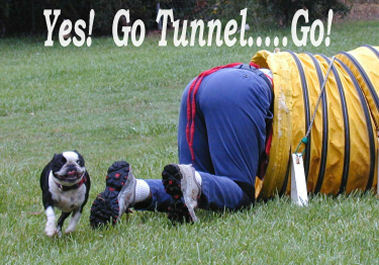 At trials, your game was to not potty on leash so we would unleash you. Then you would take off and look back to see if a recall would get you a treat! Very clever, Janie! 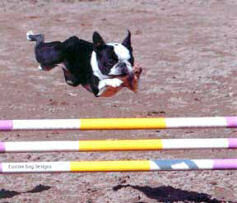 In agility, you were always fun and did your best and that was darn good! You looked like a little football scooting across the ground with your big chest carrying so much heart! As qualifying times got shorter, it was hard for you to make time as perfect and precise and as fast as you could run. 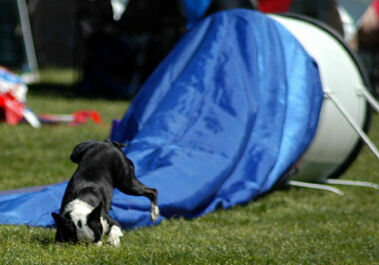 It didn't seem fair to see bigger dogs in the 12" class run wide and still qualify. Having 17 of 20 required Double Q's and 363 of 750 points required for your AKC MACH, we looked forward to 2007. A rule change would allow you to jump 8" and a new F.A.S.T. (gamblers) class, would be right down your alley! 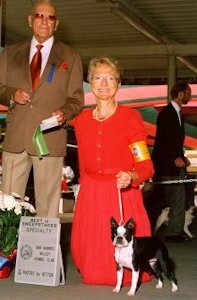 There are judges and competitors to this day who remember and talk about your being the only one (including dogs in all other jump heights) to qualify and/or win a NADAC Elite Gamblers class. Distance work was your forte and you really knew your directionals! 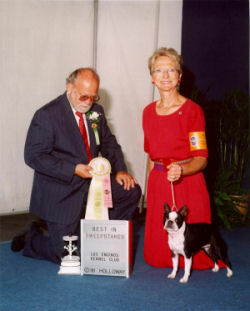 You had a big fan club including fellow competitors with Border Collies who praised your performances to us. You earned a NADAC Outstanding Performance Elite Gamblers Certificate and an Outstanding Performance Elite Agility Certificate. You were wonderful, courageous and daring! To everyone's shocking surprise, you left us so quickly. Your mind was willing, but your battle to survive had physically taken its toll. You were always so happy, ready and willing to play - we had no idea of your pain. Janie, our darling Linky, you are one of a kind. . .legendary. . .our heroine of life! We all love and miss you so very much. Thank you for all that you gave unselfishly and for blessing our lives.